With the weather being so cold in Bangalore it is becoming so hard to get out of bed and the worst thing is they chapped lips and dry skin. I being oily skinned , use a face wash and afterwards apply a moisturiser to moisturize my face. 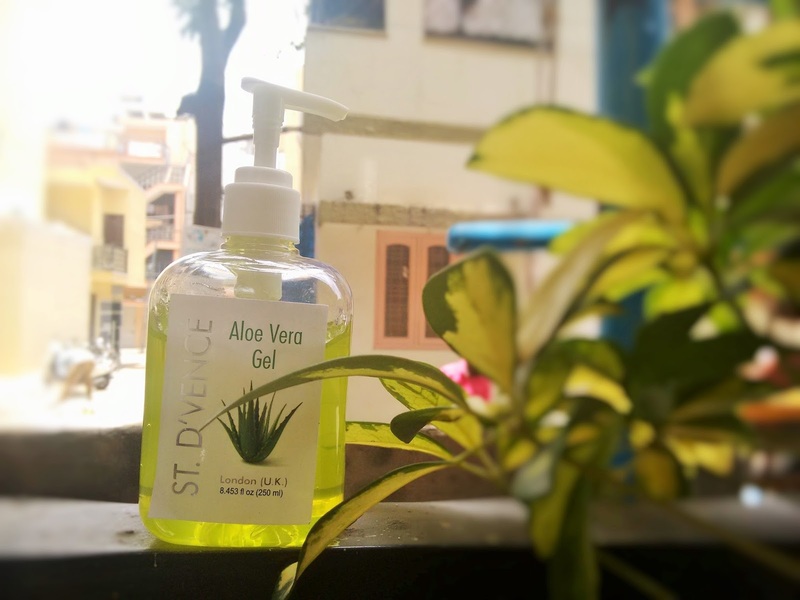 A few months back I started using the St d'vence mutani mitti lotion along with ST Dvence moisturiser and I was a BIG fan of it and hence when I got a mail from St d'vence which included a coupon code on buying their aloe vera gel I decided to buy it as I was on a lookout for a good aloe vera gel. 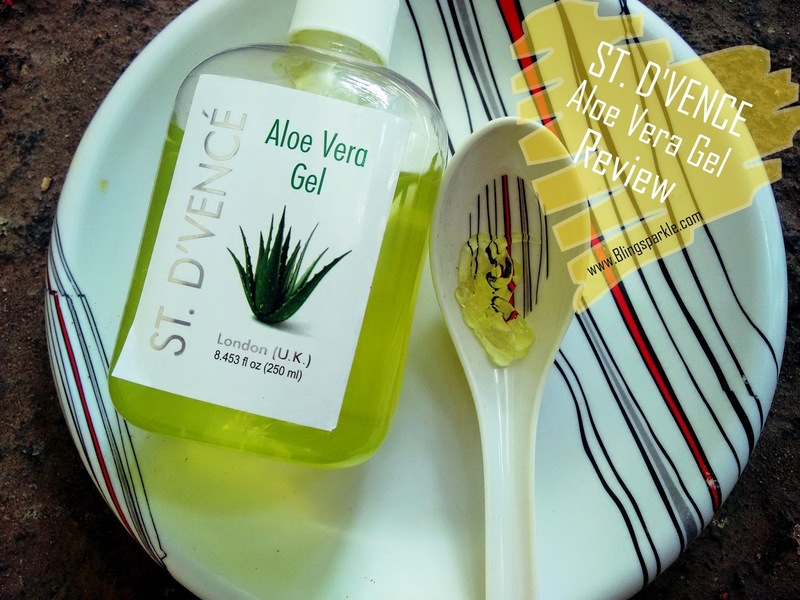 I ordered the St D'vence aloe vera gel from amazon.in and I was happy with the price I had grabbed the gel for. And now after using for 5 months I am ready to review this product from ST D'vence, which is a London based brand.I simply loved the previous buys from ST D'vence which included their moisturizer and multani mitti lotion and hence went ahead with buying this aloe vera gel. I was pretty impressed by the st. d'vencé company claims sited on Amazon. And most of the claims by the brand did stand true but the fact that it contained a lot of chemicals make this just another aloe vera gel in the market. I used it not just for moisturizing but when I got burnt slightly or even when I was bitten by a mosquito and it did cool and ease away the burning sensation. Reduces Acne and Blemishes, also helps heal Sunburns, Cuticles, Insect Bites, Razor Burns, Rashes and Wind burns. It soothes and hydrates dry, rough, itchy, or irritated skin on contact. It's formulated & designed by St. D'vencé in London, especially for the Indian Skin. Manufactured in India under the Make In India initiative. We all swear by the aloe vera gel. 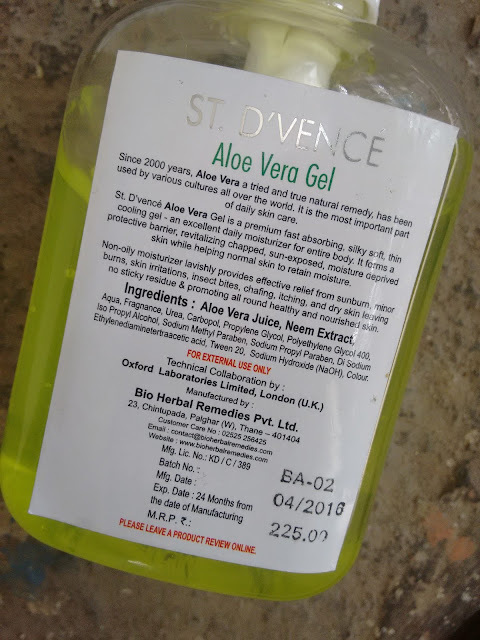 Although many prefer using the gel extracted straight from the aloe vera plant, many of us (including me) dislike the sticky residue it leaves or simply dislike using aloe vera extracts from the plant during the day. I might use aloe vera gel during nights but during daytime I would prefer a gel based aloe vera moisturizer. The best part it being a non oily moisturizer ! So more points from me for being a non oily one. I loved the packaging of the aloe vera gel as it comes with a pump dispenser which ensures there is no product wastage. The gel comes in a clear plastic bottle which lets you see how much product is left in the the bottle. It comes in a non sticky thick gooey gel like consistency which is smooth when applied on skin. It has a mild fragrance which I like. It moisturizes my face for 5-6 hours and I use it before applying my makeup. I bought this product because I wanted an aloe vera gel which would substitute for the real aloe vera extracted straight from the plant. 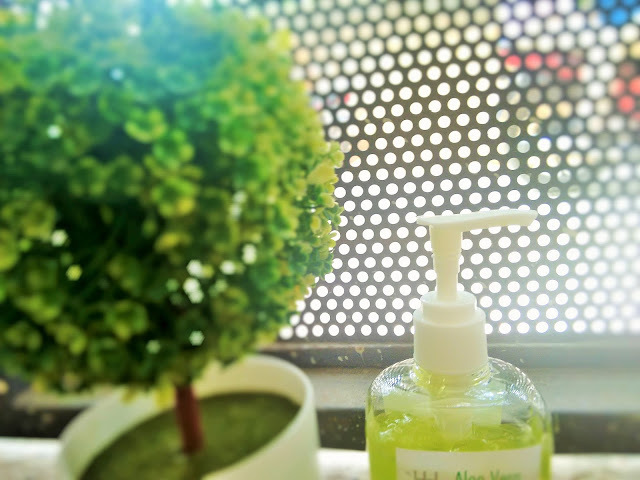 Many of my relatives have recommended using aloe vera for face and hair and raved about aloe vera uses plus I have read tons of articles everywhere as to how fabulous aloe vera gel was. I did try this and a few aloe vera gels from other brands before and found this to be a little classier than the others in terms of moisturizing and soothing. 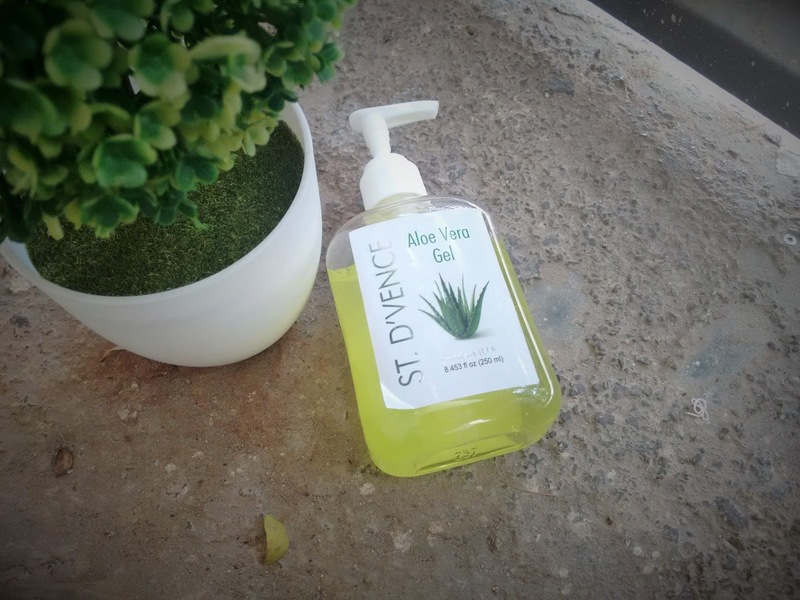 Although St dvence aloe vera gel is multipurpose I used it as a moisturizer for the first three to four months after which I found it had many parabens (My bad as I din't read the ingredients list) After which I stopped using it around my eyes and used it on my body rather than my face. I think this is great for soothing insect bites ,and inflammation . I would recommend you to use it as a moisturizer for your body but not for your face. For the face I would rather use the sticky extract of the aloe vera plant and I have finally planted a few aloe vera plants in pots and placed it in my balcony (yayy!) But for a quick relief from rashes, wind burns, and sunburns you can give this ale vera gel a try. It does hydrate my skin and in the four months I used it n my face I din't find any breakouts and it proved to be a great moisturizer for me . But now that I know it has a lot of chemicals in it I would probably not use it on my face and use it for other purposes including hydrating my dry rough elbows and knees. Available on Amazon.in. Buy it from here. Provides relief from rashes, burns and cuticles. The light green color is a downer for aloe vera gel in nature is colourless. They could've avoided addition of the green color. It is not 100% natural. Available only on amazon and few other online websites. I wouldn't buy it again as I would like to use a more natural aloe vera gel formula moisturizer rather than this one which contains paraben's , which are harmful. I recommend this for soothing sunburns , insect bites and is great for moisturising your arms, elbows and face. But I don't think it will suit dry skin and those who dislike parabens and stuff might wan't to give this a miss!